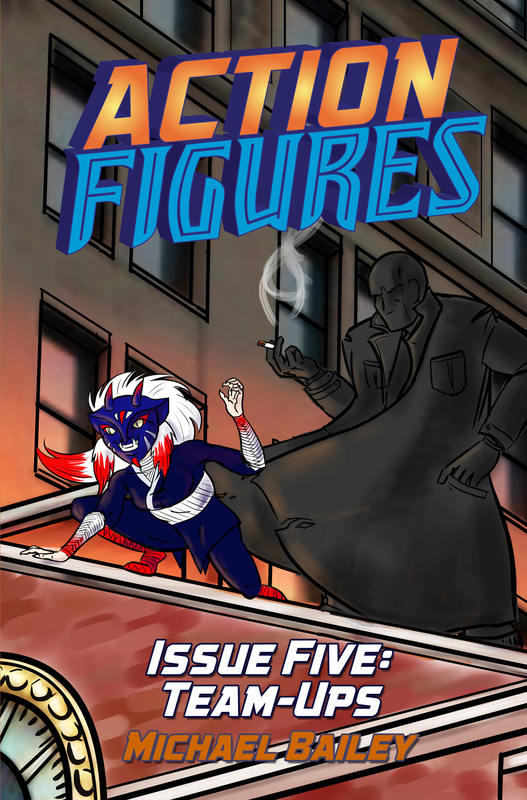 Now that the cover is finished, that can only mean one thing: Action Figures – Issue Five: Team-Ups is ready for release! The Kindle edition should be live on Amazon.com within 24 hours, so keep your eyes peeled — or go to my Amazon Author Central page and you can sign up to receive notices when Team-Ups (or any other book by me) hits the virtual bookshelf. The print edition will probably be available next week after Tricia finishes up the back cover art and I go through the process of getting and reviewing my proof copy. And remember, everyone, Action Figures – Issue One: Secret Origins is free for the Kindle for two more days. Get a friend hooked! It really is incredible how fast you come out with books. The first one came out barely two years ago, and this isn’t even your only series! Where do you find the time? I’m lucky enough that this is my more-or-less full-time job. I help my wife out with her business half the week and write the other half, and working as a reporter for 15 years taught me to write quickly without compromising quality. Sadly that project has been relegated to the realm of pleasant memories and noble failures. I have the raw footage somewhere and a not-quite-final cut that lacked sufficient polish to earn its way into any competitions or small festival. Oh, well.